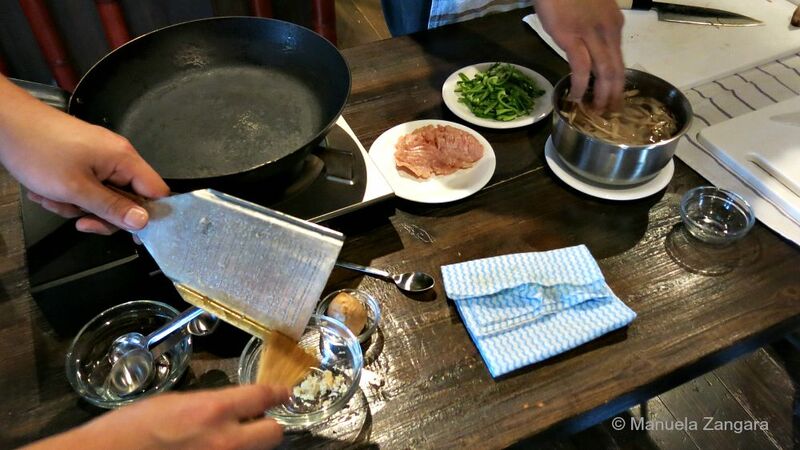 One of the things I had on my “must-do” list for our Japan holiday was a cooking class. 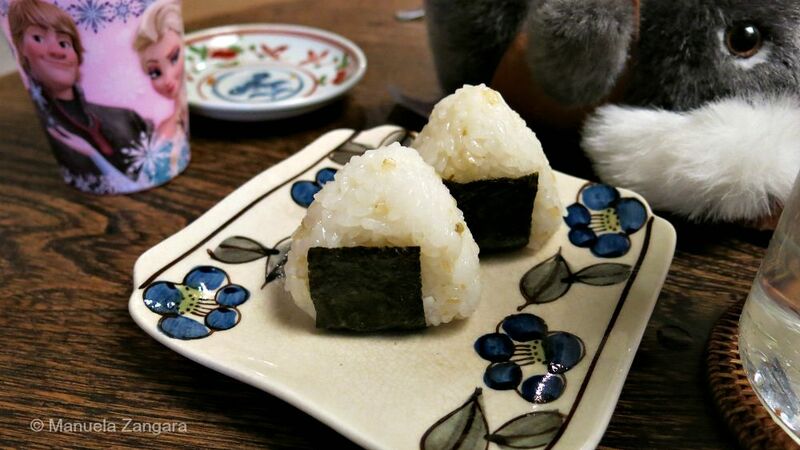 I have always been intrigued about learning other countries’ cuisines and Japanese food is one of my favourites. 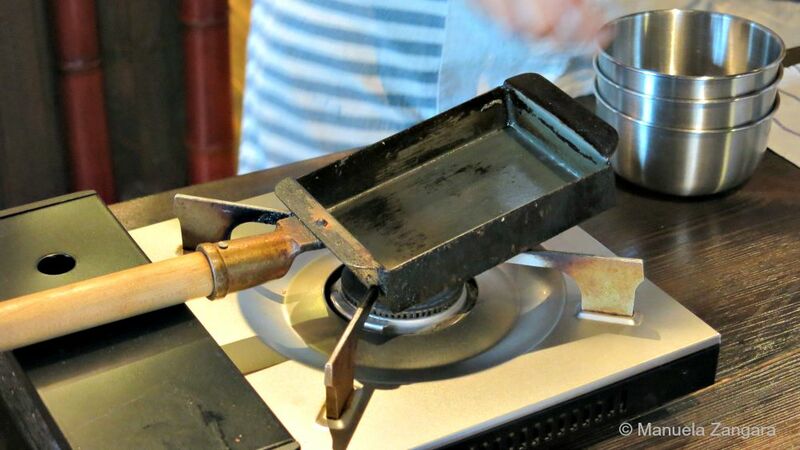 As we were spending 6 nights in Kyoto, I thought it would be the perfect place to try such an experience and deepen our immersion in the local culture. 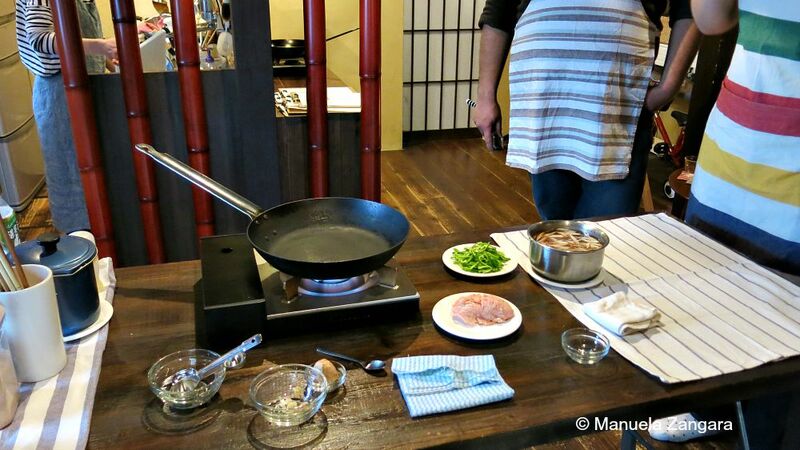 If you are a foodie, Haru Cooking Class is an experience not to be missed. 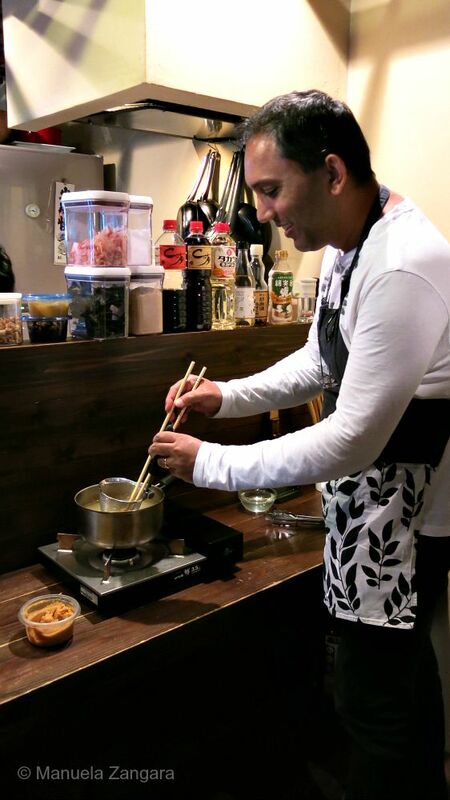 The intimate class (6 people max) is led, in English, by Taro Saeki (a former cook and Japanese guesthouse manager) and his lovely wife Yoshiko and it’s all about easy, classic Japanese home cooked dishes… just what I like! I must admit that Taro has my dream job! 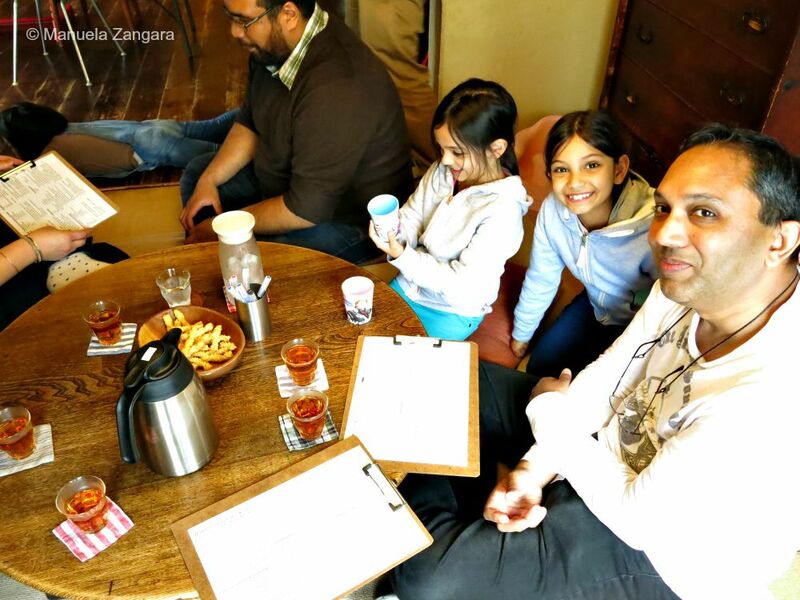 As you know, we were travelling with our 2 daughters, but that was not an issue. Taro was kind enough to let them come for the class and they had a blast. 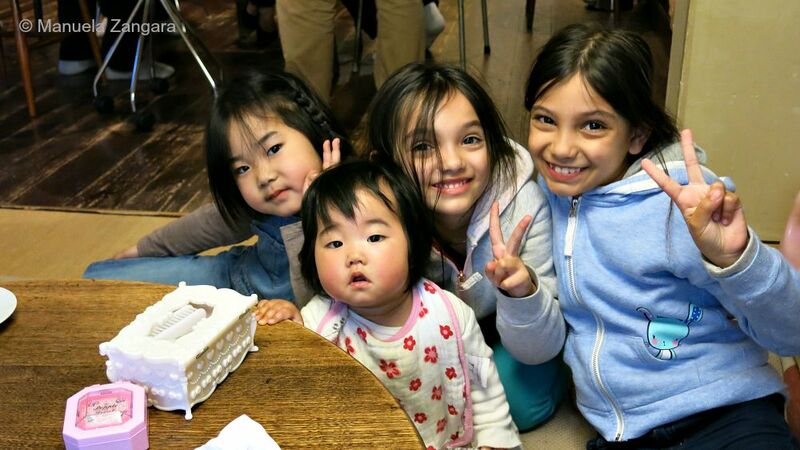 I think it became their favourite memory of the whole trip, also thanks to Taro and Yoshiko’s beautiful little girls: Haruko (who was about the same age as my youngest) and little Kyoko. 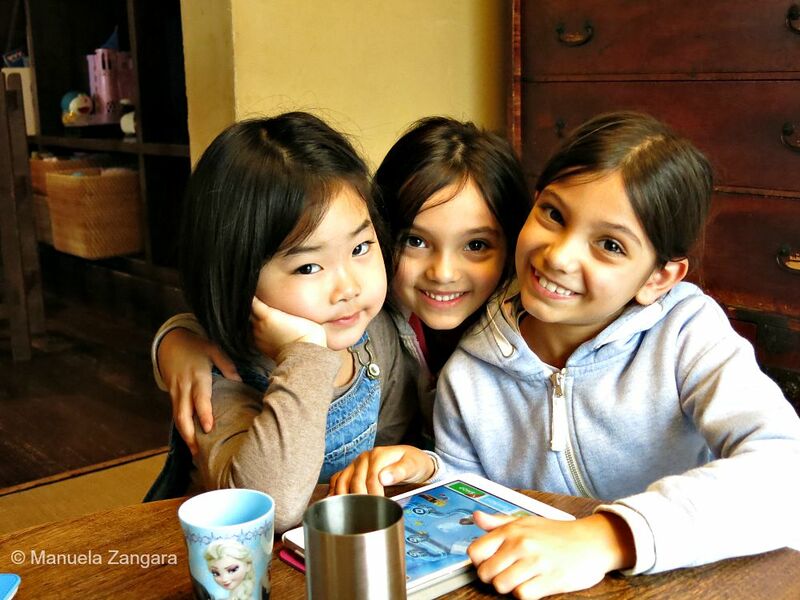 I am always amazed by how children do not need to speak the same language to be able to play and have fun together! We learnt about the five different types of soy sauce and how and when they should be used in Japanese cooking. Did you know that the light colour soy sauce, which contains more sodium, is generally used in soups and sauces, as it brings out other flavours? Dark soy sauce, instead, tends to be used to hide or tone down other unwanted flavours. 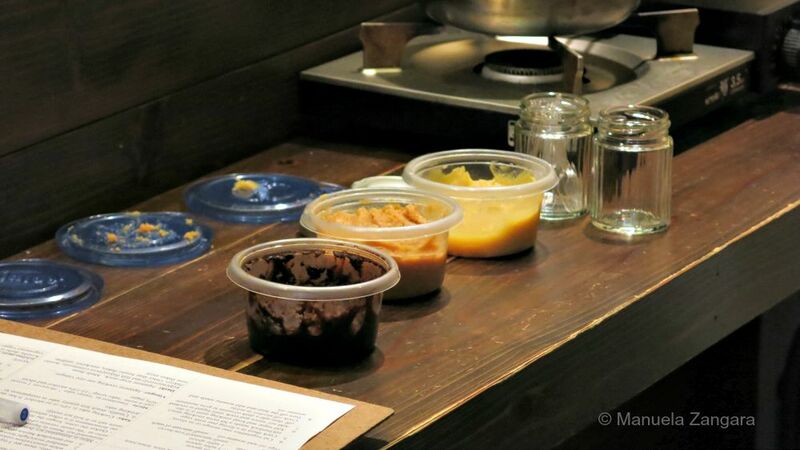 We also learnt about (and tasted) the different kinds of miso pastes available… from the milder (the lighter one) to the darker (which tastes a bit like… sun dried tomatoes!). 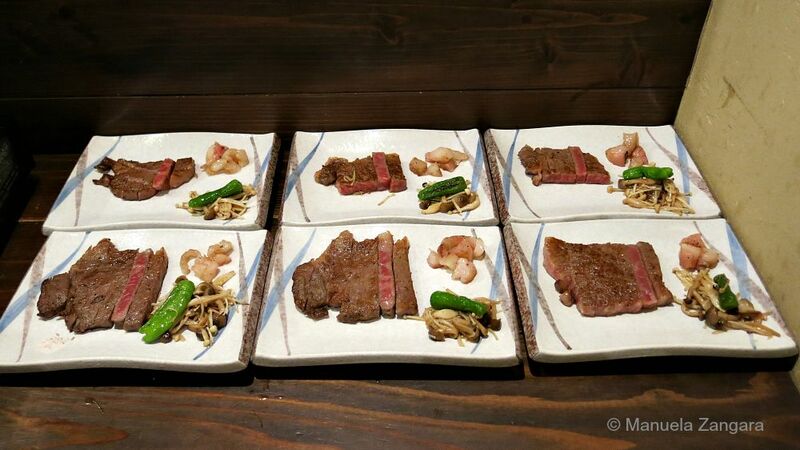 We also learnt a lot about the world famous Kobe beef. 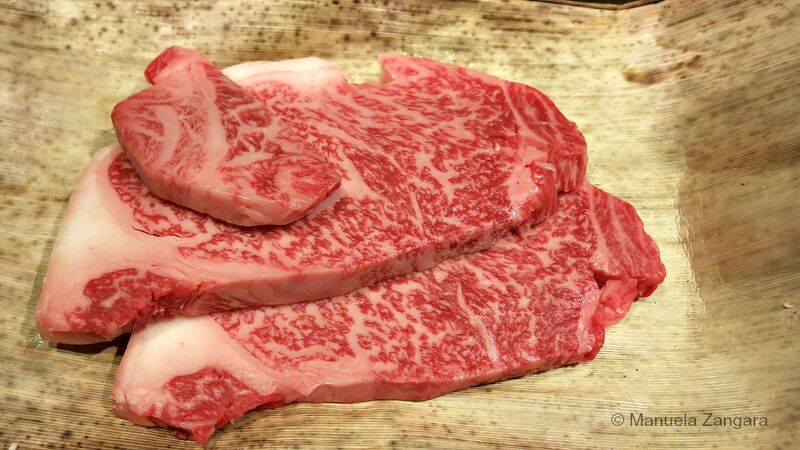 As you know, Japan is the home of wagyu beef (which literally means “Japanese Cow”). 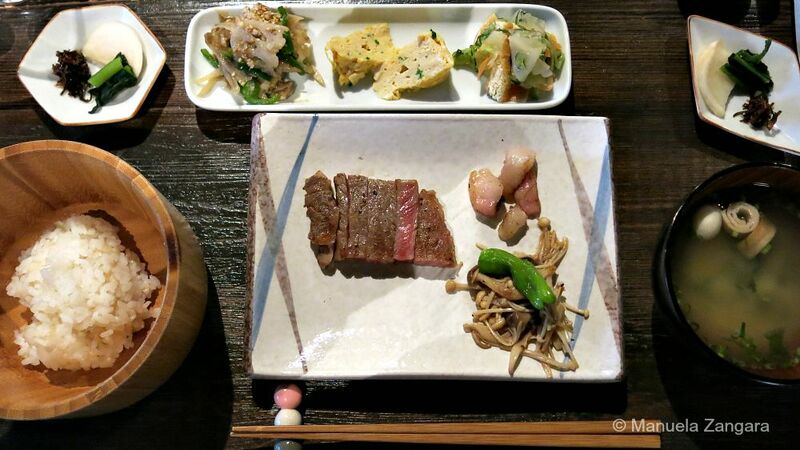 Taro explained to us that four specific breeds of beef fall under the ‘wagyu’ category, one of which is Kobe Beef – the most famous. Taro told us that Kobe beef breeders are very meticulous about raising their cows and the herd numbers are kept very small for better quality, and of course higher prices. 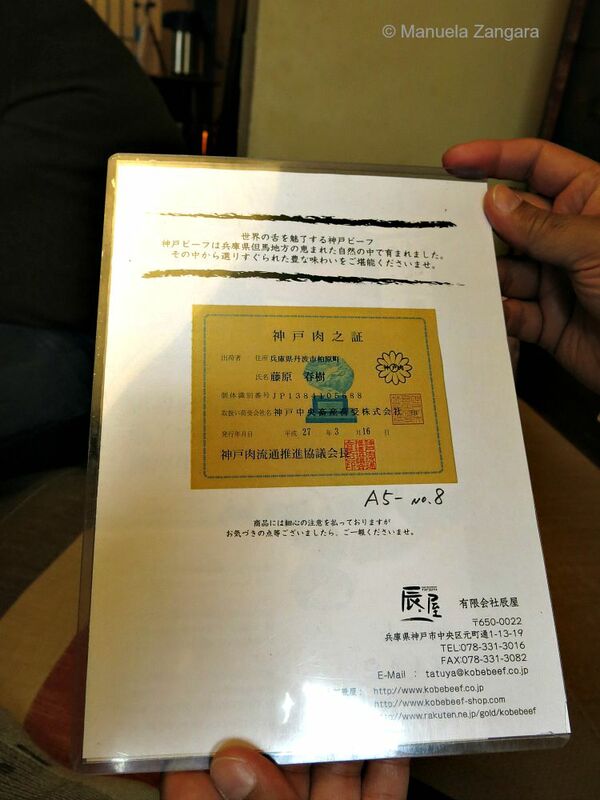 Also, he told us that the real “wagyu” can only be eaten in Japan as wagyu can only be considered as such if the beef is slaughtered in Japan itself. I will make sure I remember that, the next time I order it here!! 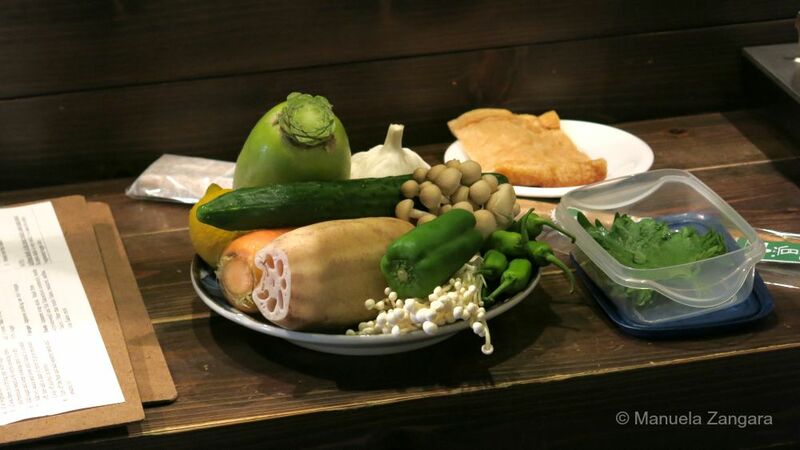 Taro buys all the ingredients from Nishiki market to support local farmers, and you can also accompany him on a market trip to check it all out for yourself (more information below). But book early, we did not find any availability! All the ingredients were super fresh. Look at this vegetable stack! Such a colourful and appetising plate! The first thing we did was to prepare the Dashi stock (Ichiban dashi). 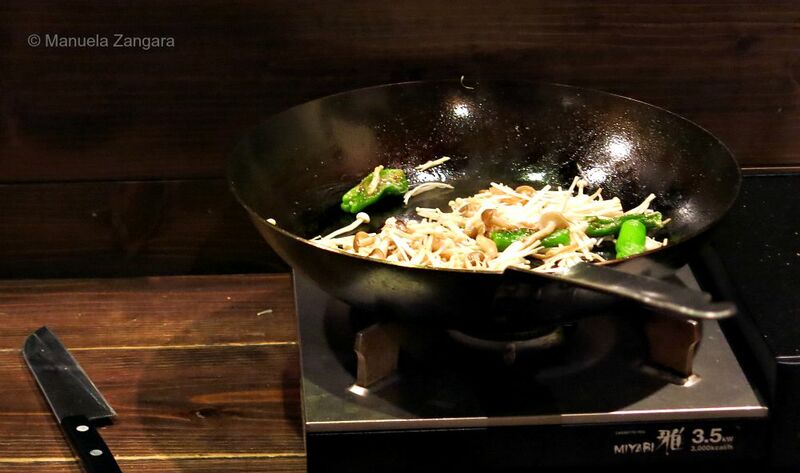 This is the most important ingredient in Japanese cuisine and it is what gives so many dishes their unique flavour. 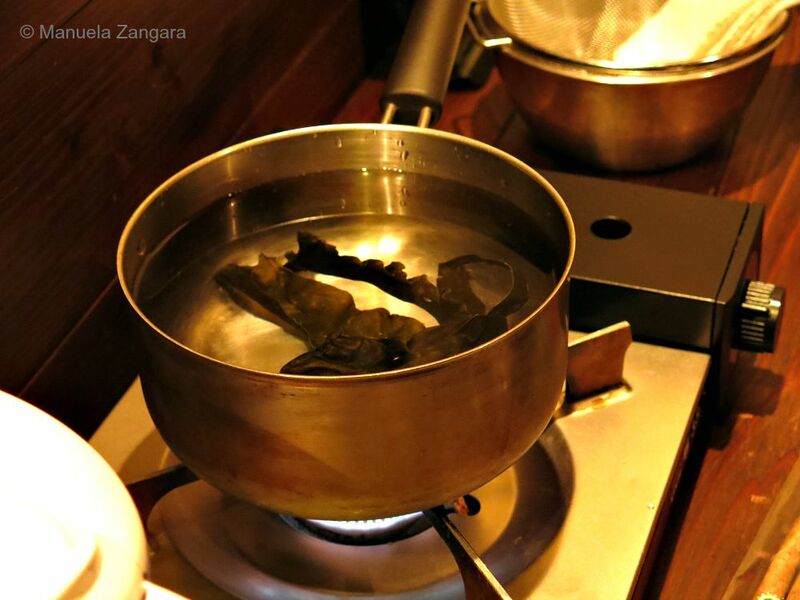 Dashi is made from boiled kombu seaweed and dried bonito flakes and is very simple to prepare. 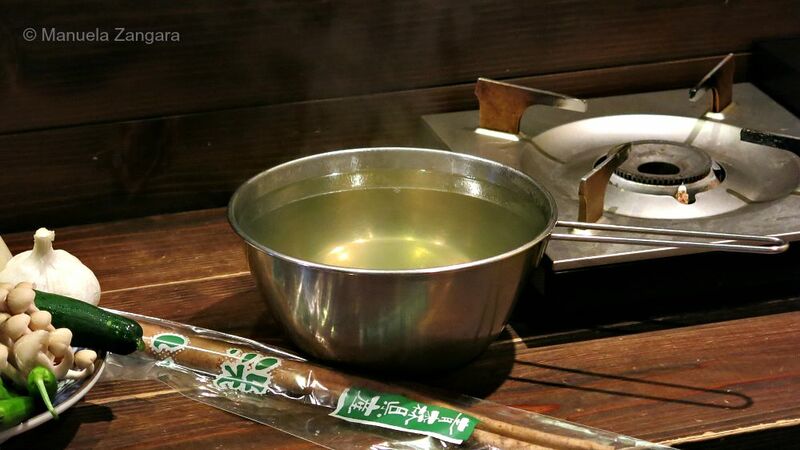 Taro recommended heating kombu in water on low heat just until it comes to a boil and then removing the kombu. Overcooking kombu can make your stock dark, cloudy and even bitter. You can use the discarded kombu as a side dish: just slice it thin and quickly stir fry it with sugar, soy sauce and mirin. Taro explained that while there are convenient powdered dashi products on the market, many are full of added salt and MSG, so it’s always best to make your own if you have the time (and it really only takes about 15 minutes to make!). While the Dashi was cooking, we started preparing the Miso Soup. 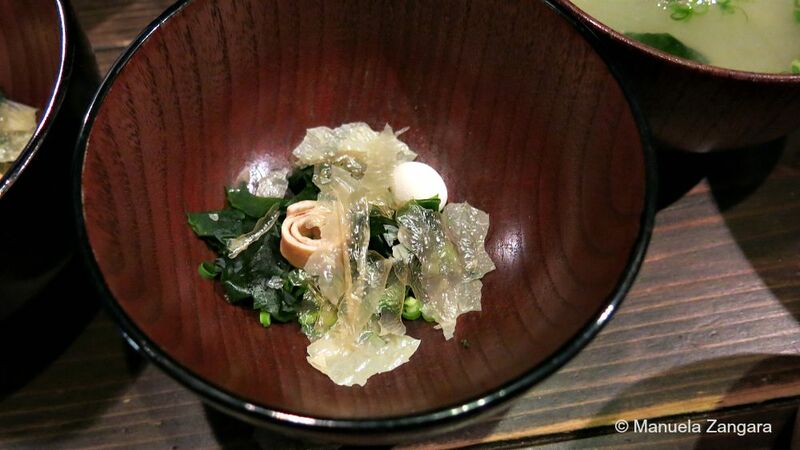 This dish is so popular in Japan that it is served with almost every meal (breakfast included). Miso paste, made from fermented soy beans, is added to the dashi stock and heated over a low flame until it dissolves. 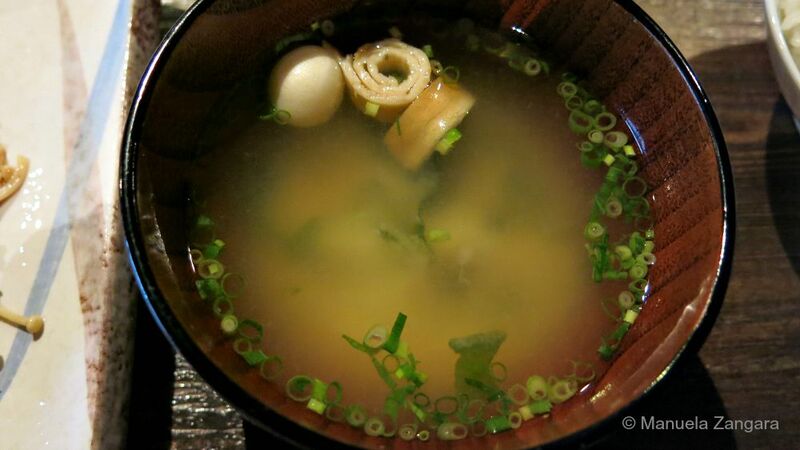 Be sure to use a strainer when dissolving the miso into the dashi as it can sometimes have a grainy texture that you don’t want to transfer to the soup. 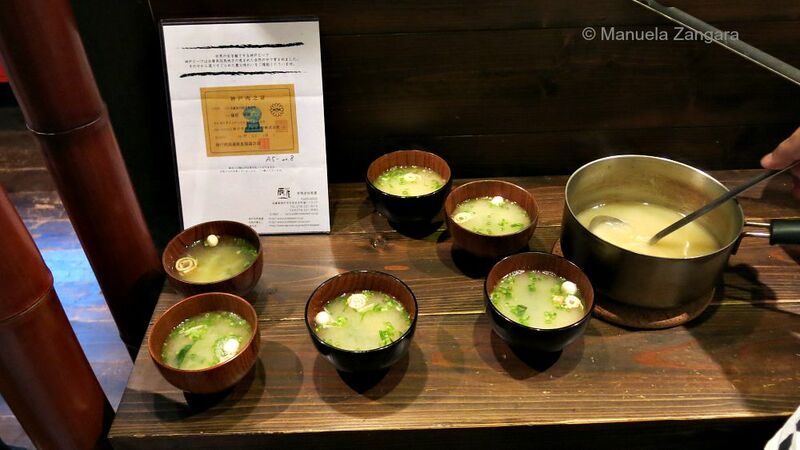 Various dry ingredients such as tofu, crackers and wakame (a type of seaweed) are added to individual bowls before the soup is ladled over the top. The next thing we prepared was the Amazu Miso Dare. 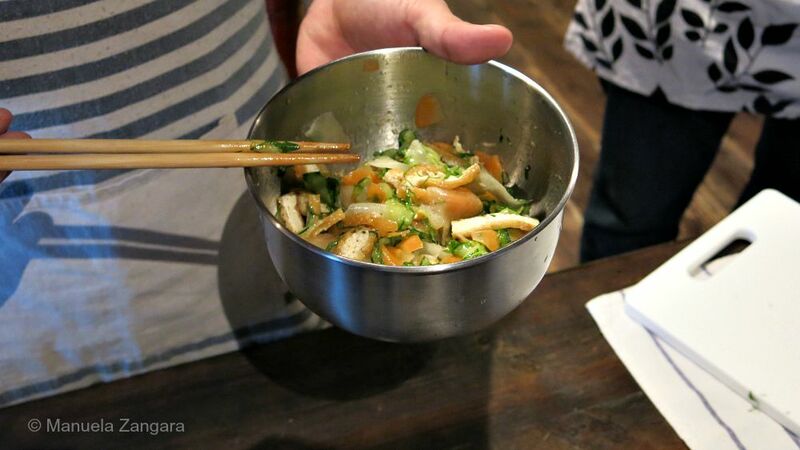 We used this sweet and sour dressing for our side salad of pickled Japanese vegetables: daikon (radish), kintoki (red carrot), cucumber, shiso leaves and fried tofu skins (aburaage). 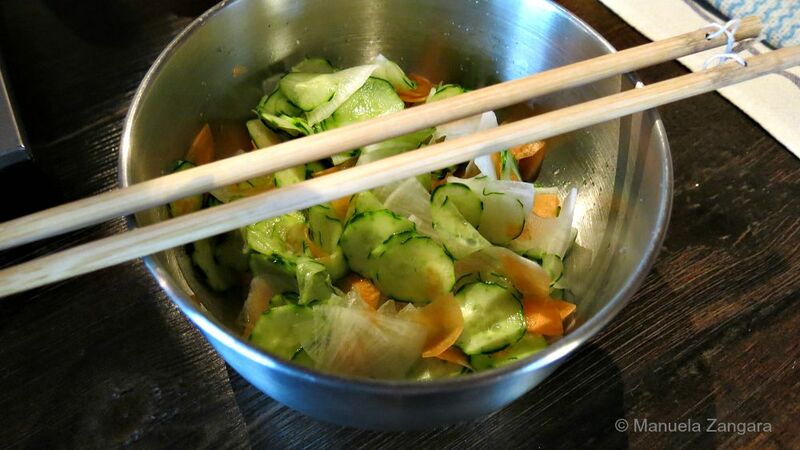 This was such a refreshing and crunchy dish! I loved the texture and colour of it! 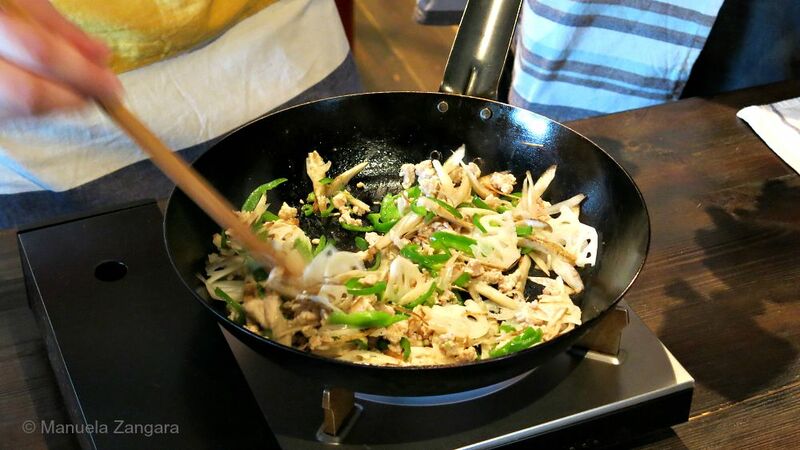 Another side dish we prepared was Nabeshigi (sweet miso stir fry), consisting of minced chicken, green pepper/capsicum, lotus root and burdock root cooked in a blend of soy, miso, mirin and sugar. 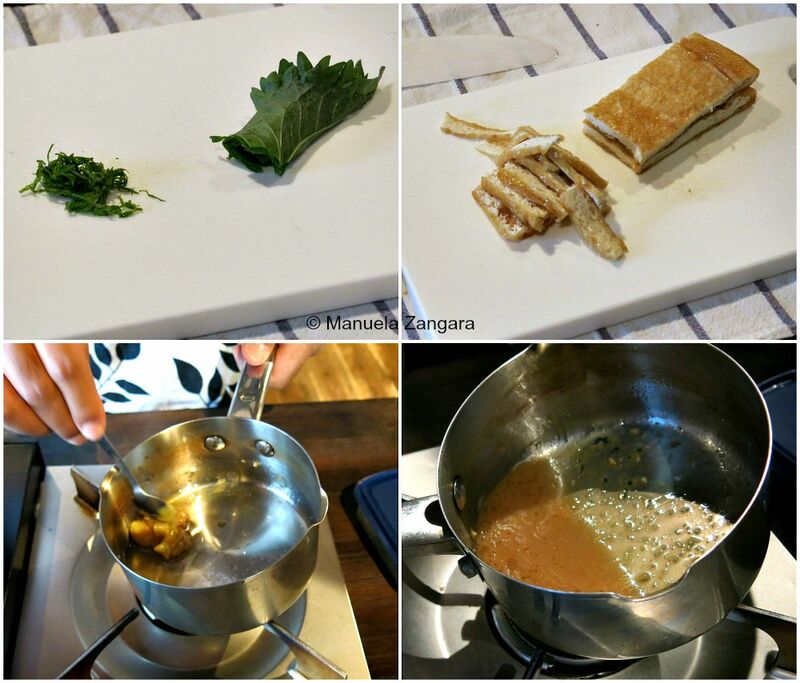 Look at this fun way to quickly julienne burdock root! This simple dish was by far my favourite dish of the day (apart from the Kobe beef of course ;-)). It was an amazing explosion of flavours! 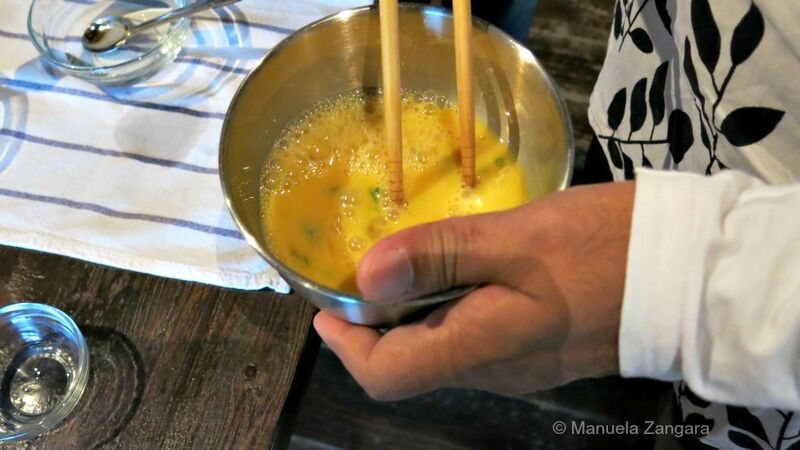 The most fun dish to cook was definitely the Japanese rolled omelette. 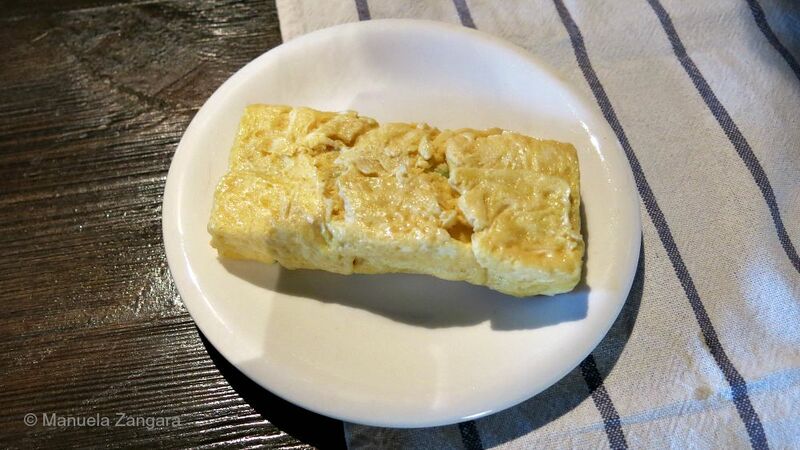 Dashimaki tamago (tamagoyaki) is made in a rectangular sauté pan and it contains light colour soy sauce, dashi and spring onions. Taro was very skilled at making this using chopsticks. We tried our best, but I think we still need some practice! 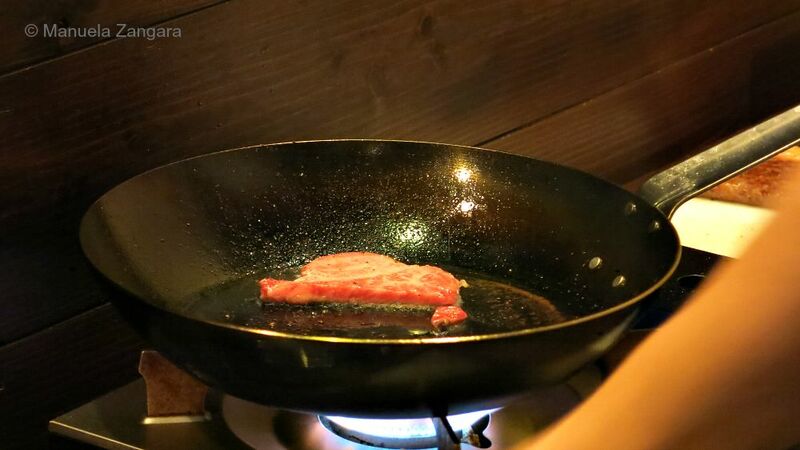 After completing our side dishes, it was time to cook the Kobe beef. 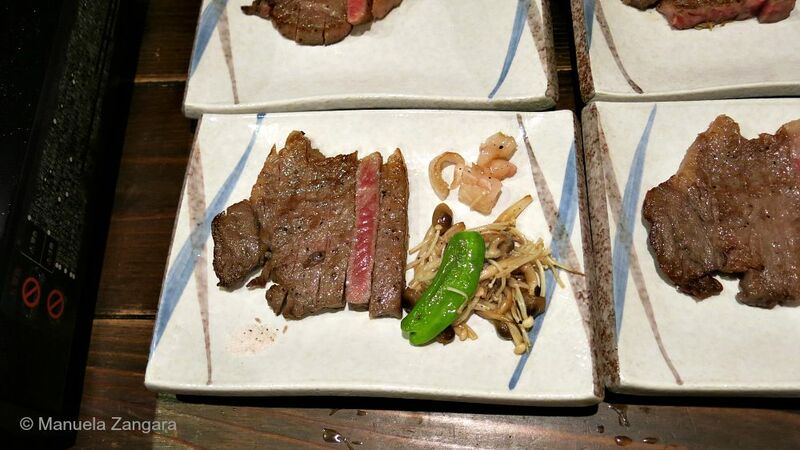 The high quality beef was cooked in Kobe beef fat to retain as much of the delicious flavour as possible. The only additions were a few cracked cloves of garlic to the cooking oil, and a light dusting of salt and pepper. 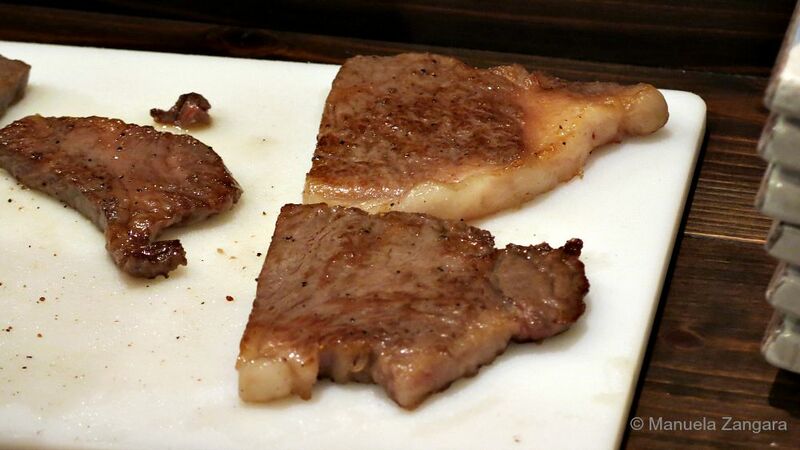 Thinly sliced, transferred to the plate and it was ready to be eaten. It literally melts in your mouth… it is that soft and buttery! 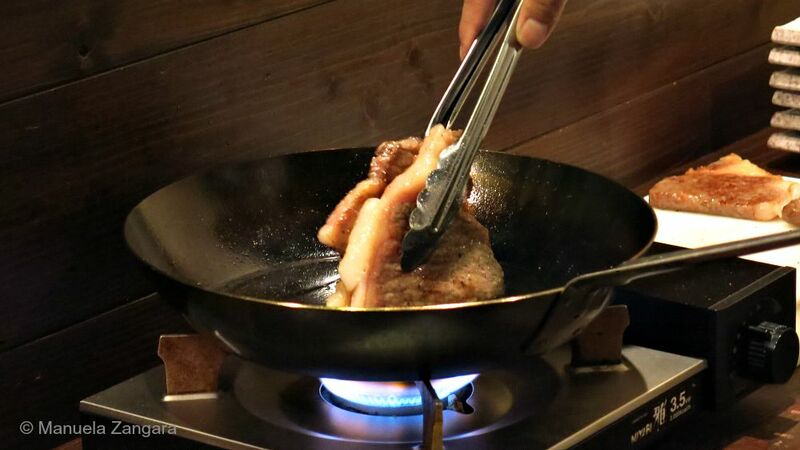 Once the beef was taken out of the pan some green peppers, enoki, and shimeji mushrooms were lightly cooked in the remaining fat, giving them a truly unique and delicious flavour and making the perfect accompaniment to the delicious Kobe beef. Et voila… dinner is ready! And it all tasted amazing! 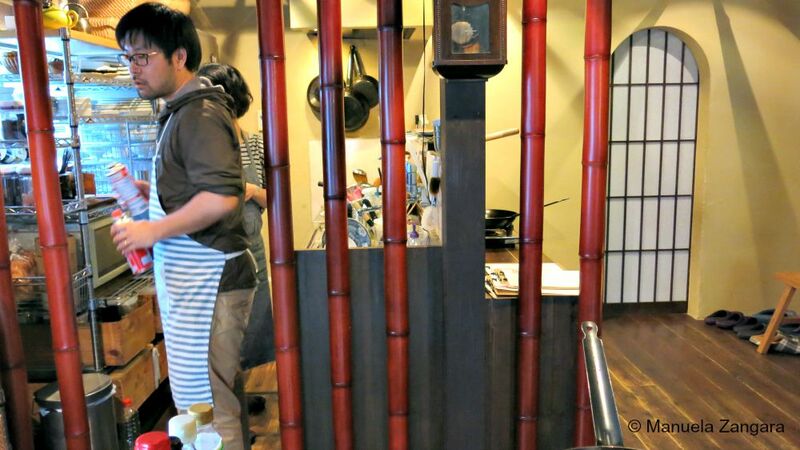 It is a highly recommended experience for anyone visiting Kyoto! 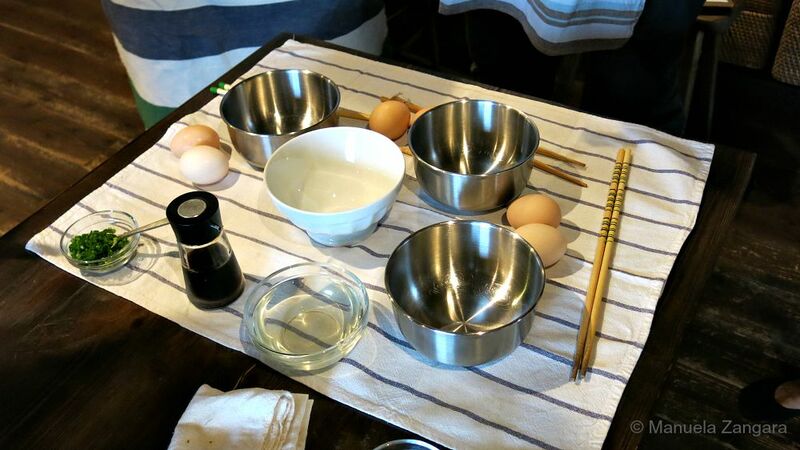 Haru Cooking Class is a really intimate experience (they only take up to 6 persons in a class, with a maximum of two different classes a day). It also gives guests a rare glimpse of the typical Japanese household. Taro provides all of the recipes of the dishes prepared along with a few additional recipes to add to your Japanese recipe collection. 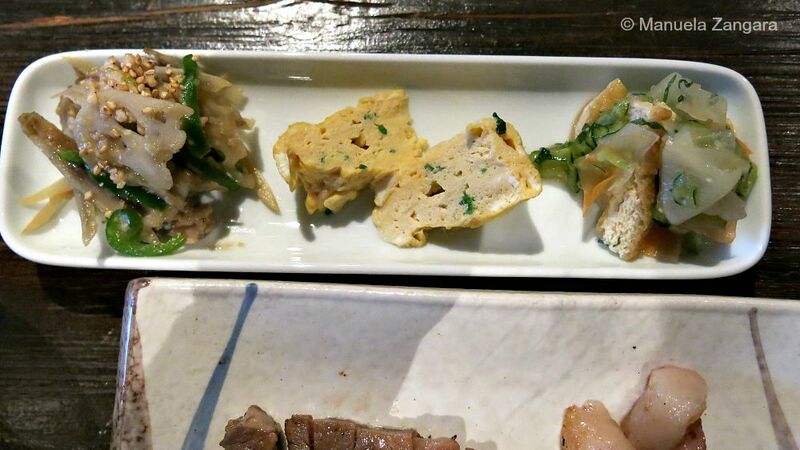 There are three different experiences available, including a Vegetarian cooking class, a Kobe Beef cooking class (what we did), and a Nishiki Food Market Experience. Located just a short bus ride away from downtown Kyoto and JR Kyoto Station, the classes are held at Taro’s family home in Shimogamo, a peaceful residential area. The easiest way to get there is to take a city bus (numbers 4 or 205) from JR Kyoto station (or anywhere on Kawaramachi dori). Get off at Shin-Aoibashi stop. Taro will meet you there.